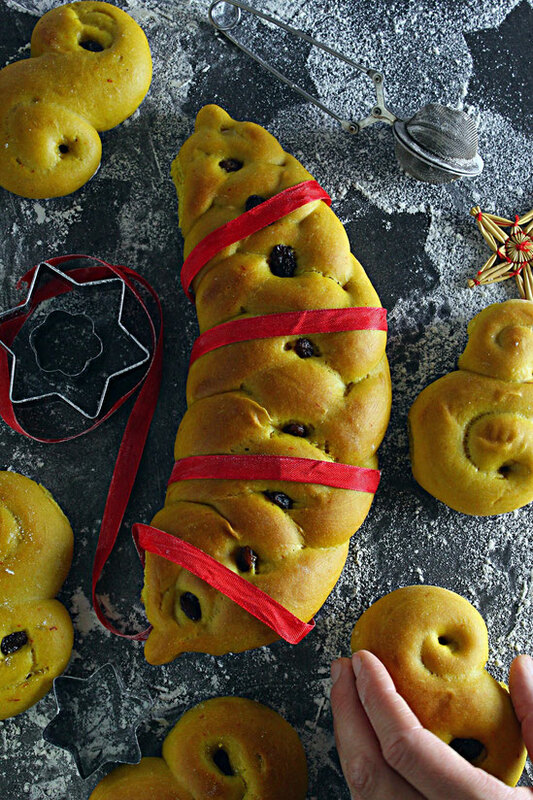 Lucia Saffron Buns / Swedish Lussekatter - simply & healthy vegan recipes that taste amazing! 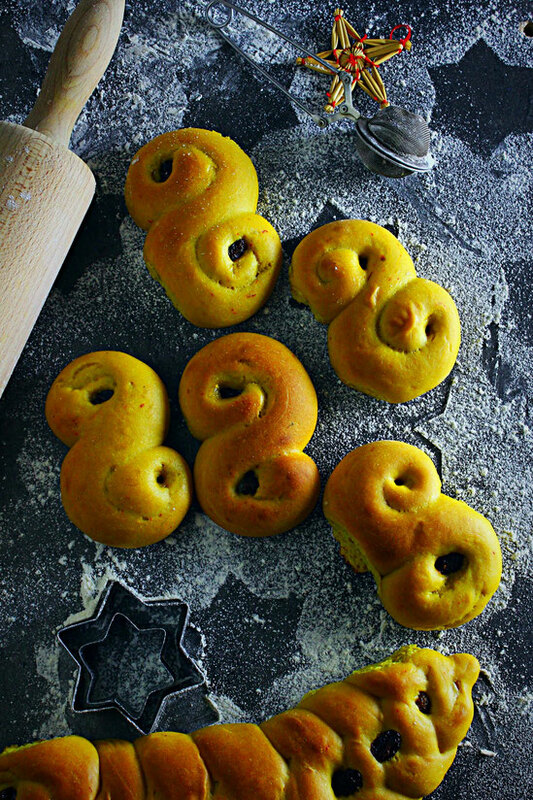 Lussekatter, Lussebullar or Lucia Saffron Buns is a traditional swedish sweet treat that the Swedes eat around christmas and especially on 13 december, on the St. Lucia Day. The Saffron Buns are not very sweet but very delicious and have a strong yellow colour from saffron and tastes perfect with some `glögg´ (mulled wine) or coffee and tea! I have made the classic recipe slighty healthier with no refined sugar and only virgin coconut. You can make them gluten free by using a gluten free flour mix if you like to. I love to eat my Lusekatter the same day as I bake them because than they are still very juicy and moist. Let me know if you like them and have a question in the comments below. Tag me @vegan.niinja if you use my recipe and post a picture on facebook or instagram. Enjoy and have a great Lucia day or advent days! Optional but not necessary: 1/2 tsp ground cardamom and a little raw marsipan. Start with soaking the raisins in some oat milk or juice for at least 30 minutes. Ground the saffron with some coconut blossom sugar and than add a little luke warm oat milk and mix with a spoon. Let it set for at least 30 minutes for a good colour and taste. Heat the oat milk until luke warm (it should not be to hot!) and sprinkle the yeast over it. Let it set for 5 minutes until foamy. Add the coconut sugar, the saffron, and melted coconut oil and mix with a wooden spoon (melt the coconut oil in a water bath). Whisk together 3/4 of the flour, salt and cardamon (if using) and add the dry mixture little by little to the wet mixture. Mix with the spoon until well combined. Knead the dough with your hands and slowly add the additional flour and the marsipan (if using) little by little. Knead the dough for about 10 minutes. It should be a little sticky but not completely stick to your hands when you knead it. Let the dough rise in a large bowl under a cotton towel. Place it on a warm place and let if rise for 30-60 minutes until the dough has doubled in size. Knead the dough again on a lightly floured table for 5 minutes. Form the dough to a ´snake´ and cut it in 10-15 pieces. Place them on a baking sheet covered with parchment paper and press down 2 raisins to each end. Let the saffron buns raise for 30 minutes on a warm place. Preheat the oven to 225°C. Brush the buns with some oat milk or aquafaba. Place in the oven and bake for 10-12 minutes until light golden brown. Let them cool 5 minutes before serving. Enjoy with some mulled wine (glögg) or coffee and tea! If you like my recipe and if you have a question, please leave a comment below! I will answer as soon as I see it!